From high school cafeterias to the floor of Congress, from "The Daily Show" to every comments section on the internet, insult is a truly universal and ubiquitous cultural practice with a long and earthy history. And yet, this most human of human behaviors has rarely been the subject of organized and comprehensive attention - until "Toward a Rhetoric of Insult". 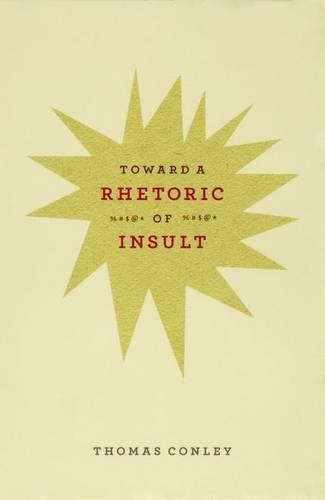 Viewed through the lens of the study of rhetoric, insult, Thomas M. Conley argues, is revealed as at once antisocial and crucial for human relations, both divisive and unifying. Explaining how this works and what exactly makes up a rhetoric of insult prompts Conley to range across the vast and splendidly colorful history of offense. Taking in Monty Python, Shakespeare, Eminem, Cicero, Henry Ford, and the Latin poet Martial, Conley breaks down various types of insults, examines the importance of audience, and explores the benign side of abuse. In doing so, Conley initiates readers into the world of insult appreciation, enabling us to regard insults not solely as means of expressing enmity or disdain, but as fascinating aspects of human interaction.